How do you choose your next product/service? How do YOU choose a restaurant, boutique, car wash, salon, storage facility (wink, nudge), or any other local business? Contemplate and dial that in to your business model. When you and your peers search online, you’re most likely presented numerous choices from the search engine. You’ll then focus in on the top 5 to 10 choices presented via your preferred search engine. Your top choice will presumably be the business with the best online reviews or highest star rating. Ring a bell? In today’s world, a shocking 92% of consumers take time to read online reviews. Not surprisingly, 82% of online shoppers trust online reviews just as much as personal recommendations. Saying customer reviews are important is an understatement; it is absolutely crucial for online conversion success. An echoed worry among businesses is of receiving fake, negative reviews. Google recently announced that anonymous reviews will no longer be accepted, protecting businesses from phony reviews. Aside from negative business posts, the downfalls of customer reviews are minimal. Carefully read through this customer review guide and become an expert on handling your customer reviews and testimonials! Yes, this is an obvious one but an important one. List your business on popular review platforms to allow for review success. Yelp, Facebook, and Google are the most prominent review platforms. Research proves that Google leads the pack as a consumer review tool, followed by Yelp and Facebook. Your initial conversion opportunity begins by listing your business on these platforms. According to studies, “five-star reviews can increase purchase likelihood by a factor of almost four times.” There is only one factor that will result in 5 star reviews: excellent customer experience. Encourage your employees to be as helpful and as positive as they can during vocational hours. 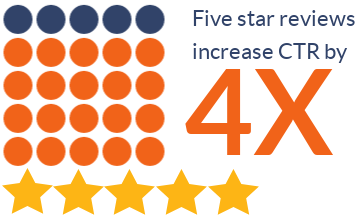 Satisfied customers are much more likely to leave 5 Star reviews and come back again in the future. Snippet Stars are stars placed beneath your business name in organic rankings. A 5-Star snippet should bedesired by every business because it creates a lucrative pool of potential tenants Research shows click-through-rates (CTRs) increase by 30% with ‘rich snippets’. Reputation Management, our easy-to-use review tool, encourages snippet stars on your organic results on search engines. Avoid underestimating the power of customer reviews. This is an inexpensive, easy, and highly effective means of increasing your conversion rate. Contact Jill Baker, Director of Sales, to get started with online reviews today.